Wow! 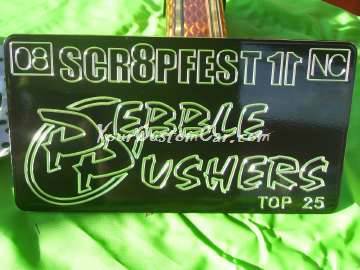 Pebble Pushers Scr8pFest 11 was AWESOME this year! 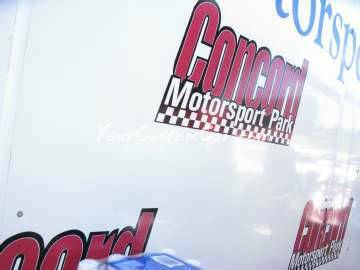 The show was held on September 19-21, 2008 at Concord MotorSports Park in Concord, NC. The weather was an amazing 70-75 degrees all three days without a drop of rain. How's that for perfect custom car show weather? Being a member of Pebble Pushers Car and truck Club myself, I helped the club with the various tasks required to hold such an awesome car show. You would be surprised as to how much is involved with holding such a large car and truck show. I was more than happy to help, even with a torn tendon in my left foot! Hows that for dedication? YourCustomCar.com was also a sponsor for this show and will be next year too! We ended up with over 300 vehicle entries that ranged from mild to Wild. Most of the participants were mini truckers (with some of the most modified trucks in the industry). There were also several custom cars , and even some rat rods out there too! Pebble Pushers always offers several events to keep the participants and spectators entertained. For instance, this year's Club Games, in which different car and truck clubs compete, included Tug-o-War, Keg Toss, a relay race, water balloon toss and more. It was loads of fun even for those just watching, like me! What's a car show without a burnout competition? A Crappy one in my opinion! Pebble Pushers did it right this year with one of our best burnout comps ever! Don't miss the Dragging contest video! Check out the next few pages for a glimpse of the best car/truck show in the east, Pebble Pushers' Scr8pFest! 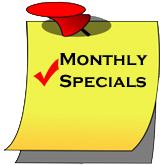 Click the links below to view the shows highlights!